When your company's end product can be used by literally every human being on the planet, you know you're in for a little travel. Or in Mike Del Ponte's case, a lot of travel -- to the tune of 100,000 miles a year. Del Ponte's business is water -- more specifically, Soma Water. This company’s cleverly designed filtering pitcher features an elegant (but virtually shatterproof) glass carafe and uses filters made of coconut shells and a biodegradable plant-based casing. 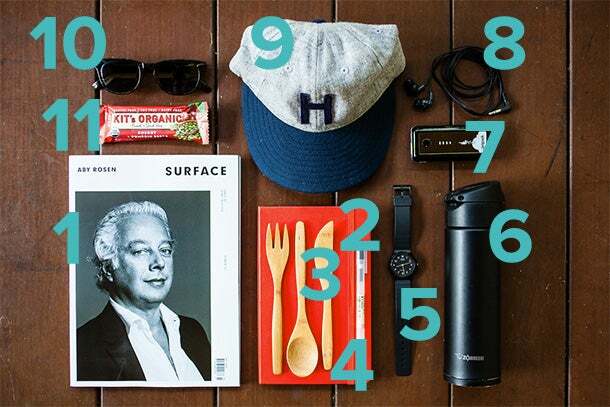 But for a healthy-living devotee like Del Ponte, all that airport time leaves him scrounging for sustenance -- so he brings his own food and drink, along with some minimalist tools of the trade that help keep his business moving by land, sea, or sky. Following a recent trip to Tulum, Mexico, we asked Del Ponte to pop open his trusty backpack for a look at the items that always make the journey with him.